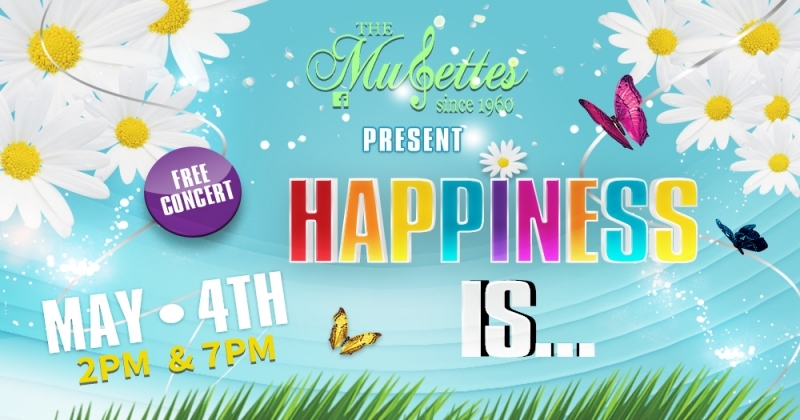 Treasure Valley’s premiere all-woman singing group, The Musettes, present “Happiness Is...”, Saturday May 4th at 2pm and 7pm at the Nampa Civic Center. This is a FREE concert, suitable for the whole family. A goodwill collection will be made to help fund productions and scholarships. This concert includes music that is fun and traditional, as well as sacred and uplifting. Since 1960, The Musettes have been wowing audiences of all ages with their traditional, fun and patriotic songs. Women of all ages and diverse backgrounds make up the group, who love to sing and love to share that talent with others. In addition to sharing their love of vocal music, The Musettes are devoted to improving the quality of music for women and students throughout the Treasure Valley through annual scholarships. These scholarships provide voice lessons for those seeking to improve their singing abilities and are awarded each spring.